One of the best things that has happened in recent years in the city is growing community participation in the management of lakes. Starting from small attempts some years ago in one or two lakes, we have now reached a stage where at least two dozen communities are working steadily to revive and spruce up the lake environment around them. Today alone, I received invitations on email threads for people to be part of three initiatives – in Yelechenahalli, Agara and Avalahalli lakes. As I drove home past Sarakki lake, I noticed the fencing work has been substantially completed on the east side. The Byrasandra revival work just this week received a state award. Some pioneers of this effort – Ilot Sea, Usha Rajagopalan, Arathi Manay, Priya Ramasubban and others have stayed a very long course in making this happen. The BBMP Chief Engineer for lakes and the conservator of public spaces – both have been extremely supportive, and the openness to public participation seen in BBMP in this division should be an example for many other things BBMP does. The nice thing also is that through these efforts, we are achieving another important goal – to increase the number of people involved in solving public problems. You can see the network effect of this in other spheres too. The Waste Out of Wealth awards given last week to six communities are a good example – five of them are within 500 metres of the groups that first took up lake revival. This is the only way forward, as Rajesh observed earlier today in his post about Praja Factory and other initiatives. Public learning and public information are the heart and soul of public participation in problem solving. I hope more and more of you will join. The scary water scenario in Bangalore seems to have gained international attention. Even as citizens in various areas are teaming up to revive various lakes in the city with the help of the BBMP and BWSSB, here is a US-based NGO offering to revive all lakes in the city. 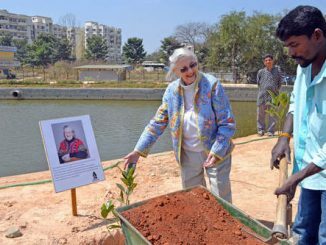 Such was her connection to Bangalore that she had been herself studying lakes in the city for the last year or so and had deep insights into the way forward for citizen action on lake preservation.